Girton Garden Society was started around 1983, and originally met in what was then Littleton House School (now St Colette’s and Gretton School). But by 1985 membership had outgrown the accommodation and meetings were moved to the W.I. Hall. This juxtaposition was to prove extremely beneficial to the village. In 1983, the Society organised a competitive show in a tent on the Recreation Ground, as part of a Fete organised by Girton Glebe School Parent-Teachers’ Association, which included maypole dancing and other traditional activities. The day was warm and windy, so the tent was left open, and a passing gust of wind blew away all the cards accompanying the displays – hopefully they were replaced correctly! 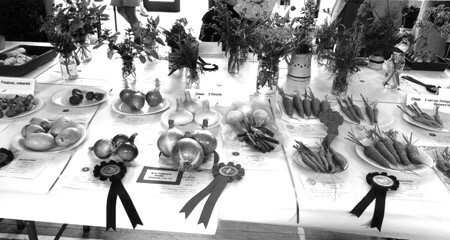 The following year, on 7 July 1984, Girton Garden Society decided to hold its first Open Horticultural Show in the Glebe School Hall. Then in 1985, Girton decided to revive its traditional July Feast Week, and all village societies were invited to take part. The then Chairman of the Garden Society, Keith Barber, and the then President of the Women’s Institute, Margaret Morrison, decided to combine the efforts of the two organisations and put on a joint exhibition in the School Hall. 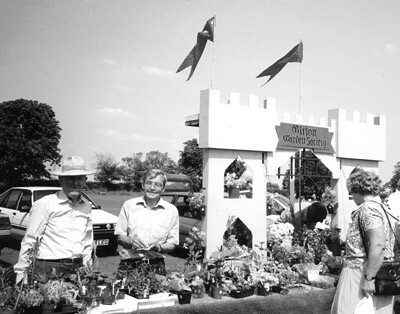 This was the beginning of what was known as the Girton Show, organised jointly by the Garden Society and the W.I., which took place each year on the second Saturday in July until 2012. In addition, for many years Girton Garden Society set up a plant stall on the Recreation Ground on the first Saturday of July as part of Feast Week. The Show was of course one of the highlights of the Garden Society year, but was by no means the only thing that went on in this well-supported society. Gardening is one of the favourite recreational activities in Britain, and even a flat-dweller can enjoy a window box or an array of pot plants. Some garden for the benefits it brings in terms of fresh and healthy produce, and in Girton many keen vegetable growers also belong to the Allotment Society (already covered earlier in this series of Focus on Girton). Others are especially attracted to gardens as places of recreation and beauty (or at least potentially). Of course, as the Girton Show demonstrated, vegetables can also be beautiful, and you don’t need an allotment to grow quite an array of exciting produce in your back garden. The Garden Society amply caters for both types of interest. Girton Garden Society is open to anyone – the membership mainly consists of residents of Girton, but some members live outside the village. For an extremely modest membership fee (currently £10) members can attend the monthly meetings which take place from October to May on the second Thursday in the month at St Vincent’s Community centre, St Vincent’s Close, Girton. Topics that have been covered in the past are wide-ranging and varied: the care of plants; wildlife in the garden; patio gardening; seed varieties; lawns; and soil science, among many others. In past years there have even been talks on “A Year in the Life of a Country Park Warden”, and “Photographing and Painting Heligan” by the artists Mally and Charles Francis. Forthcoming highlights include a talk on “Saving the world through plants’ by Robert Brett who has worked at Kew Gardens and as Temperate Curator at the Eden Project and ‘Gardening in London Parks’ by David White. During the summer months, when all keen gardeners prefer to be out of doors rather than meeting inside, Girton Garden Society usually plans some outings – perhaps a coach trip to an interesting garden outside Cambridge, and a local visit, for example to one of the Cambridge College gardens. In the past, the society has ventured as far afield as the National Fruit Tree Collection in Kent and the Royal Horticultural Society (RHS) flagship garden at Wisley. Ambitious outings like this take a lot of organising, but this year (2015) a trip to the RHS garden at Hyde Hall near Chelmsford took place on Wednesday 17th June and a visit to Clare College Gardens on Wednesday 22nd July. The Garden Society has been affiliated to the RHS from the early days. And this brings us back to the Girton Show. For the premier award of the horticultural section of the Show was the Banksian Medal, awarded by the RHS to the exhibitor who had earned the most prize money in the horticultural section of the Show (excluding novice classes), and which was presented at the very first Show in 1985. The standard exhibitors’ cards for the Show were provided by the RHS, which also suggested the judging rules. Judges, who were appointed by the Girton Show Committee, were recognised experts in their various fields. Some had served as judges in national shows such as the Chelsea Flower Show, yet they still found it worth their while to judge at the Girton Show. But this did not put off newcomers, for the atmosphere at the Show was far from formal, and participating by entering your straightest beans or most lovingly tended pot plant, and going round after the judging admiring the wonders that others have produced, was as much fun as carrying off a red rosette. And the Show grew as a well-tended plant should: in 1985, the first Girton Show attracted 132 entries; in 2009 there were more than 500. Profits (or losses) from the Show were divided equally between the Girton Garden Society and the Women’s Institute. The Show was open to all members of the Women’s Institute and the Garden Society, to all those normally resident in Girton, and to all pupils at Girton Glebe School. Categories in the horticultural section of the Show remained much the same over the years. But there were some changes. For example, in 1989 there were five separate categories in the flower arranging section, from cottage garden to foliage; by 2009, as the popularity of this hobby declined, there were only three. But its modern class nevertheless provided an up-to-the-minute challenge: in 2009, flower arrangers were asked to produce an arrangement themed on “The Wimbledon Tennis Championship”, and in 2010 they had to put ingenuity and artistry together to tackle “Strictly Come Dancing”. In 2008, reflecting a widening interest in organic gardening and in growing one’s own produce, a new category appeared, “A small bucket of compost suitable for enriching your garden”, and in 2009, “Three free range hen’s eggs”. A special, non-horticultural, attraction for the Show in 2010 was a display of vintage motor vehicles (including tractors) in the playground behind the Glebe School. Another change was the increase in the number of categories open to children and young people. The “Young Girton” section had eighteen separate categories in four different age groups, starting with those aged 3 and under. Of course, many of the young persons’ classes were in creative handicrafts rather than gardening, but youngsters had an opportunity to show what could be done with their parents’ surplus vegetables! And budding gardeners could show off their green fingers by entering a class in the 4-7 and 8-11 groups for “Three types of salad vegetables grown in a container”. Sadly, the Girton Show no longer exists but this year (2015) saw a minor revival of a more informal competition at the Family Fun Day in Girton Feast Week on Saturday July 11th. The Garden Society and Allotment Society invited Girton residents to enter a number of informal classes for vegetables and flowers for both adults and children. The details were available in the Girton Parish News for June. Another event during the year is the annual Plant Sale, which, this year, took place on 2 May at 46 Cambridge Road. It opened for business at 2.00 p.m., and was so popular that almost everything had gone by 2.45! All sorts of plants are donated by Garden Society members – tomato plants, seedlings, cuttings, shrubs – all at a fraction of the cost of garden centre plants. Profits from the sale go to the Garden Society. Finally, if any further inducement were needed for interested gardeners to join, an extra benefit of membership is a 10 per cent discount on purchases from Oakington Garden Centre and Madingley Mulch, which can very quickly repay the membership fee. Add to that the opportunity for learning from fellow gardeners and from expert speakers at meetings, and the pleasure of sharing your hobby with other enthusiasts – Girton gardeners, what are you waiting for?